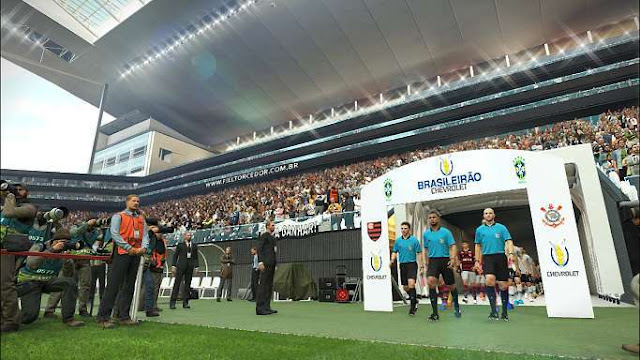 Entrance and winner scenes : Brasileiro, Coppa Italia, DFB Pokal, DFL Supercup, Supercoppa Italiana and Trophée des Champions. Brasileiro has his real trophy (already in game). Trophée des Champions has modded trophy. It look alike the real one, not 100% but I can't mod better. All others cups haven't trophy (the players raise their arms to celebrate). The people who hold the flags are now dressed according to the competitions (adapted colors). Improved Ligue 1 gate texture. First, you have to delete the existing Serie A entrance folder : "C:\PES 2019\modules\EvoSwitcher\EvoEnterance\"